Therapy for Acute Myelogenous Leukemia: What Therapy and When? Simply put, the treatment of acute myelogenous leukemia (AML) has 2 steps: the first step involves therapy to get it into remission, and the second step involves therapy to prevent it from coming back. Over several decades our approach to the first step has largely remained the same, but our approach to the second step has evolved significantly. 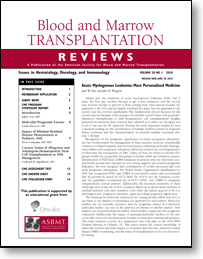 The fundamental clinical decision for the second step has become: is the prospect for durable control better with posttransplantation chemotherapy or with hematopoietic cell transplantation? Insights gathered incrementally from research have allowed us to tailor our therapies and avoid a “one size fits all” approach. Perhaps the most important insights for step 2 decision-making are the identification of biologic markers present at diagnosis before treatment and the characterization of minimal residual treatment after step 1 therapy. within the cytogenetic risk groups to further refine our treatment options. histological and cytogenetic remission, again providing prognostic significance. after stem cell transplantation remains an important unanswered question.